Smart takeaways from Ask, Listen, Learn, a program of Responsibility.org. Kids and alcohol don't mix. Print our student-teacher guide, "Wrapping Your Brain Around the Effects of Alcohol" which includes awesome, inspiring classroom activities! Teachers have always played a leading role in underage-drinking prevention, but at what grade level? Research shows that communicating with students as early as nine years old makes sense. Together, we can help kids commit to saying “yes” to a healthy lifestyle—before those challenging teen years hit. Ask, Listen, Learn‘s science-based digital resources give younger students a unique platform to learn all about the developing brain and the role alcohol may play in their near future. Teachers use Ask, Listen, Learn‘s lessons plans, worksheets, and videos to give a deeper understanding of what the brain does—and what alcohol does to it. This research-backed strategy aims to influence how students deal with critical choices in the coming years. 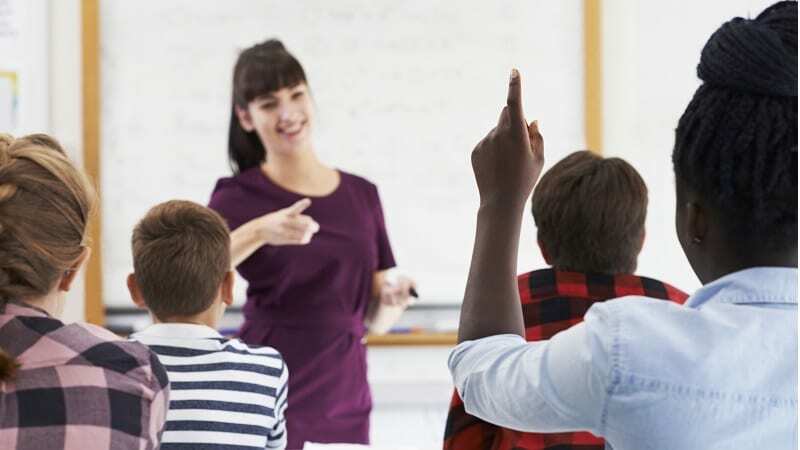 Here, we break down 10 fascinating takeaways from Ask, Listen, Learn that teachers wisely use to make sure their lessons on the topic pack a powerful prevention punch. 1. Kids are ready to talk about underage drinking prevention (and it’s easier than everyone thinks). This is true whether you’re the teacher, parent, or the student! While underage drinking might feel like a mature topic for late elementary school or middle school students, you can get the conversation started comfortably with the right approach. While three out of four families have talked to their kids about underage drinking at least once in the last year, only about 40 percent of those families focused on brain development. It’s a key strategy teachers can deploy in the effort to teach kids about the effects of underage drinking. 2. A tween’s brain is their head coach. And it’s just getting started coaching the team. When students dig deeply into the ins and outs of the impact their brain has on the rest of their body, physical, mentally, and emotionally, their eyes may widen, and their mouths may drop! Understanding that their brain isn’t fully developed until their twenties is a powerful realization—and one of many facts they’ll repeatedly refer to when faced with the choice to drink. 3. Valuing a healthy body prevents underage drinking. Thinking about healthy living gives students the chance to think broadly. At this age, students are beginning to care more passionately about what they eat, recognize that movement matters, and pay attention to how they’re dealing with big emotions. They discover an appreciation for how everything works together toward a well-lived life—and their healthy choices matter for the best outcome. 4. Nine- to 12-year-olds face real peer pressure, too. It may not be after-school-special material just yet, but the CDC reports that this age is a critical time for kids. They start to form stronger, more complex friendships. They also become more aware of their bodies, as puberty begins, and become more independent. Understanding and communicating these challenges in school and at home is key. 5. There’s (thankfully) more than one way to say “no” to alcohol. Nine- to 12-year-olds may be faced with underage drinking choices before we realize it. They need options to communicate with their peers. There’s not a one-size-fits-all approach to handling a peer-pressure underage-drinking situation. Kids gravitate to what makes sense for their friend group. They also thrive when given a variety of strategies that will work for their own personality and in specific situations. Do they need to be blunt and direct or somehow divert the offer clearly? Students can find their voice to say “no” in a way that makes the most sense to them. 6. Younger students should think about mentors now. Building a solid support system, be it composed of teachers, their parents, coaches, or like-minded friends, is empowering for middle school–age kids. They’re building their circle of trust. The more we talk to them, the more they’ll talk back (in the most respectful way, of course!). 7. Underage drinking prevention is a team effort. Parents are your partners—and that’s true if you’re the teacher or the student in the underage-drinking equation. Research shows that parents are the leading influence on a student’s decision to drink alcohol and understanding of the consequences that come with that choice. Students at this age may not say it, but they want to feel supported. A letter home to parents will encourage family support and also support the development of a full-circle partnership to get kids to say “yes” to their health. 8. Students notice adult behavior more than we may know. Young students mirror what parents and teachers do, whether they would admit to that or not! Leading by example is key. So, the adults in their lives have a great opportunity to showcase certain behavior, like planning who will drive home from a party, serving nonalcoholic-drink options, or hosting enjoyable social alternatives that don’t include alcohol. 9. Setting goals gives students the opportunity to persevere. Students face challenges academically and socially daily at this age. 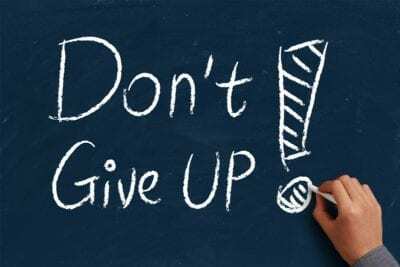 Learning to set and commit to personal goals teaches them not to give up (or give in!) when their values are questioned. Whether that’s homework, exercise, or issues with friends, talking and writing about what they want to achieve helps their long-term ability to say “yes” to a healthy lifestyle. 10. Big picture? All conversations are important. Ask, Listen, Learn! Teaching underage-drinking-prevention curriculum opens up the classroom to talk about emotions and other adolescent challenges more easily. So stay positive and authentic by asking questions with open-ended answers. What are they passionate about? Do they worry about their fears? How do they see their future? Your conversations empower them to make all kinds of smart, healthy choices! 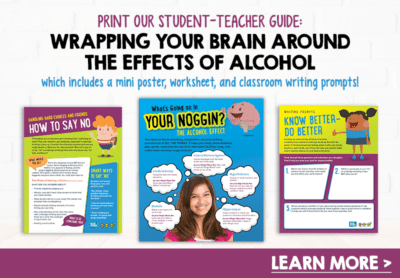 Check out our student-teacher guide, “Wrapping Your Brain Around the Effects of Alcohol” which includes a mini poster, worksheet, and classroom writing prompts! Ask, Listen, Learn is a FREE underage drinking prevention program for kids ages 9-12 and their parents and educators. It is complete with lesson plans, worksheets, and videos, and is aligned to national standards. Find out more!